There is a simple ethical foundation for open access to and free usage of basic resources such as air and water: the mere existence and the development of every human being depend on them. But even fundamental ethical principles and human rights do not always prevail in real life. In history and even now, many knowledge and information resources are claimed as exclusive private property – that is, an owner has the right to exclude others from access to and usage of the property objects. But aren’t there some promising signs that history is not only, as Hegel has claimed, a development of freedom for the few to freedom for all, but also a development of the right of the few to control basic resources to the right of everyone to have such access and use? Access must be sustainable, of course; the resource cannot be allowed to be overused. So a major challenge is how to make free and open access compatible with sustainability. In the following pages, I suggest applying the concept of sustainability, a basic concept of ecology, to knowledge. In doing this, I will also claim that the idea of a “knowledge economy” and “knowledge ecology” are compatible. Ecology in general is concerned with the sustainability of natural resources by protecting them from overuse. A knowledge ecology is also concerned with sustainability, but with the sustainability of immaterial goods. This cannot be achieved ­­­­­­­­­­­­­­­­­­­­­­­­­­­by making knowledge a scarce resource, but only by providing open access to and free use of it on open platforms. This redefinition of sustainability stems from the differing character of water and knowledge as goods. Knowledge is not consumed or exhausted when used. On the contrary, the more it is used, the more it benefits many people, and the greater the likelihood that new knowledge will be produced from existing knowledge. Such access and reuse makes knowledge sustainable not only for the present but also for future generations. Knowledge ecology can therefore be defined as the sustainable treatment of knowledge and information (Kuhlen 2004). It is still a new and controversial concept. But there might be a consensus that what I call “immaterial commons” have the same ethical foundation as natural resources: Everyone needs them. Water (let us take it as a symbol of all other basic natural material resources) is essential for the existence of all human beings and for life in general. Yet human life also depends on permanent supplies of immaterial goods such as knowledge, information and culture. In this sense, knowledge is the equivalent of water. This is what I have in mind with the aphorism: Knowledge is the water of the mind. Water for physical survival and knowledge for intellectual development. What is true for water is also true for knowledge. Both can be subject to exclusive private property rights. More accurately, access to knowledge has always, at least in modern Western societies, been subject to private appropriation through private intellectual property rights. As the reality of commercial information markets shows, people can very successfully be excluded from open, unrestricted access to knowledge. Since the groundbreaking volume by Charlotte Hess and Elinor Ostrom (2007), knowledge has been increasingly considered as part of the commons, even though most academic literature still focuses on material, not immaterial commons. To be more precise and use a distinction that Elinor Ostrom takes pains to make, knowledge is part of the common heritage of humankind and thus a common-pool resource (CPR), but it is not necessarily a commons. Knowledge is the result of human development and the ensemble of intellectual activities that has been made publicly available in whatever media form, thus making it a very prominent common-pool resource. But that CPR need not be managed as a commons; it can conceivably be managed by the private rights holders or the state, for example. “Knowledge,” as understood in the literature, generally refers to “all intelligible ideas, information, and data in whatever form in which it is expressed or obtained” (Ostrom and Hess). In our understanding (different only slightly from Ostrom and Hess, but with major consequences) knowledge is primarily a cognitive concept, and cognitive concepts and theories, originally mental structures in the creators’ minds, are only accessible, communicable and usable when they are represented in a media form. But the representation itself is not knowledge. Strictly speaking, a book is not a knowledge object; rather it contains knowledge. A piece of music is not a knowledge object; it contains an idea of what the composer had in mind. From an information science point of view, we should avoid the term “knowledge objects” and rather speak of “information objects” when referring to objects that represent knowledge in some kind of media and that are made publicly available and are thus capable of communication and usage. Books, pieces of music and films are information objects that can be traded on commercial information markets or can be freely exchanged in open environments. It is not our intention to insist on this rather sophisticated distinction between knowledge and information (Kuhlen 1991), and correspondingly knowledge objects and information objects. Therefore, in the following we will for the most part use the abbreviation k&i (knowledge and information), and occasionally use knowledge as a generic term to embrace both knowledge and information – keeping in mind that knowledge refers primarily to a common-pool resource, whereas knowledge as commons (resulting from an application of institutionalizing procedures to the pool resource) is in fact accessible and usable information. This distinction has some consequences for “excludability” and the right to property. There is general consensus that knowledge itself is not protected by copyright nor by the European “Urheberrecht” (authors’ right). Once knowledge is made publicly available in the world, it is in principle open and free to everyone. This is an important and fundamental right, but useless if access to knowledge is withheld or not made possible. In reality access to knowledge, not to mention its free usage, depends on the ways that knowledge is made visible (transformed into information objects in whatever media form), by whom, and with what intentions. It also matters how these information objects are disseminated and made available for use, and under which conditions. 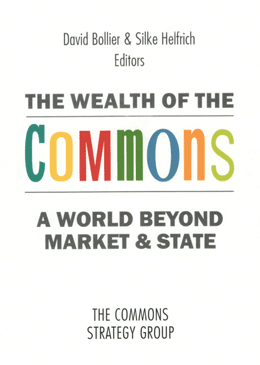 It is important to remember the distinction between common-pool resources and the commons that Elinor Ostrom has pointed out. Common pools of physical natural resources are provided to us by nature. Immaterial pools are the result of human development and/or the common heritage of humankind. Each society at any given time in history has developed ways for making common-pool resources accessible and usable, and also for protecting them against overuse and ensuring that they are available and useful for future generations. In the language of institutional economics, common-pool resources only become a commons when they are institutionalized. The institutionalizing forms are highly dependent on culture and on people’s interests, however. They are also driven by the media and technology environments available at any given period of history and thus are subject to change. For instance, the analog world of the Gutenberg print paradigm makes knowledge visible, accessible, communicable and usable in different ways than electronic tech­nologies in the Internet do. Changes in media and the technology environment have also influenced moral behavior – for instance, who can claim authorship and ownership of k&i, and with different implications for access and usage, for who is willing to share k&i, and who will seek to enclose it. The media and technology environment also influences the way political power and economic interests are structured and justified; in modern times, this occurs mainly through laws and the regulations for intellectual property rights. The ways that commons are built and institutionalized are also affected by technology and the principles and procedures for administer it. Commons are not hieratic with characteristics given by nature or by religion, but rather, to put it in the terms of modern sociology, they are socially constructed. They are based on common, normative understandings. From an ethical point of view, the ways in which knowledge as a CPR is institutionalized into a knowledge commons are appropriate if they contribute to just, inclusive and sustainable forms of living for the highest possible number of people. There is obviously a clear dichotomy between widespread social norms for the production and use of k&i that have been developed in electronic environments, and the dominant organizational and economic principles that govern the production of information goods in international information markets. There is not necessarily a contradiction between the institutionalization of k&i driven by economic self-interests and social norms. But at the moment there is a large chasm between the two and some deep incompatibilities. For commercial actors, k&i must be made to be scarce objects to which access is controlled and limited, mainly by price, technical barriers and/or legal (copyright) constraints. Whatever objections we may have from a theoretical point of view, commercial publishing procedures serve to institutionalize knowledge. The knowledge production takes the form of a private goods regime, however, not a commons. Figure 1 visualizes these alternative ways of institutionalizing knowledge, although it is surely too simple (as suggested by the illustration) to believe that modern societies have a free choice between an ethically driven approach and an economically driven one. Information market failure is becoming more and more evident, particularly with respect to science and education; the traditional intermediaries that guaranteed free access to k&i, e.g., universities, libraries, often can no longer afford to buy or lease commercial information products, or their services are limited and constrained by copyright regulation and/or by digital rights management (DRM). The public and people involved in science and education are no longer able or willing to buy or lease information that they themselves may have produced and peer-reviewed; they may want appropriate compensation from publishers or the ability to self-publish their information. Producers of k&i feel increasingly uncomfortable with the ways that commercial information markets try to disable people’s “information autonomy” – i.e., how works may be used by others and what they expect as fair remuneration. Actors in open environments tend to share the resources they need to produce k&i and, consequently, they appreciate and take advantage of the value-added effects of working collaboratively. Producers of k&i believe that k&i are part of the public sphere and thus can be freely used so long as moral rights (chiefly attribution) and, sometimes, the privacy of the producers are respected. Users of k&i usually agree to attribute authorship of k&i objects they use to the original producers. They also accept that the k&i they produce by using open k&i will be made available under the same conditions as they enjoyed, i.e., giving the same usage/exploitation rights to other users. Producers and users of k&i feel responsible for the sustainability of k&i so that future generations can benefit from it. Producers and users of k&i in open environments do not object to the commercial exploitation of k&i as long as free access is guaranteed. The preferred practice is to release k&i immediately, without an embargo time, so that k&i can be commercially and openly available at the same time. A complete version of the work and all supplemental materials…in an appropriate standard electronic format is deposited (and thus published) in at least one online repository using suitable technical standards…to enable open access, unrestricted distribution, inter­operability, and long-term archiving. Publishers on commercial information markets are becoming more and more aware that their business models based on exclusive proprietary of k&i are not only losing their economic appeal, but authors, users, and publicly funded institutions are rebelling. Therefore publishers feel forced to agree to new forms of open publishing. Two distinct forms of OA publishing are dominant. The so-called “Golden Road” to open access, which provides immediate access to works on a publisher’s website, comes the closest to our understanding of knowledge as a commons. The “Green Road” approach, by contrast, relies upon authors self-archiving their works in their institutional Web repository, at a university, for example. Such self-archiving might be a secondary publication, after a certain embargo period (usually six months), following publication in a commercial journal. Figure 2 illustrates some of the possible models for institutionalizing open access k&i in both open and proprietary contexts. Figure 2 also shows that a knowledge economy and knowledge ecology do not need to be mutually exclusive; they can be entirely compatible. Some publishers, for example, have begun to follow the Golden Road and make their journals available in open access forms – for instance, Springer with its SpringerOpen journals (http://www.springeropen.com). This sounds revolutionary and econo­mically impractical because the OA paradigm requires that all articles be freely available and maintain high peer-review standards, but also because authors retain their copyright completely. But Springer, a commercial company, is still able to earn a profit from its OA publications because it charges users and their institutions for the expense of producing journal articles (which are then made available free online). In the end, it is the public (as taxpayers and students) that pays for commercial OA journals and, in addition, meets the company’s expectation of profits. At this stage, there is increasing public consensus that publishing in science and education should not be subject to commercial exploitation. On the other hand, there is a willingness on the part of many science institutions to finance commercial OA publishing, in order to keep professional publishers with their expertise in the market, as long as they make their publications freely available to everyone.2In any case, the future of scientific publishing will be OA publishing. Given the increasingly open, collaborative and derivative nature of k&i production, does it still make sense to speak of individual intellectual property rights (IPR) rather than common IPR? Is there a need for new types of property rights now that knowledge is increasingly produced collaboratively? After all, two pillars of copyright law – the concept of single authorship and that of the final, unchange­able work – have become more and more obsolete. Which property rights should the public have to commons objects such as k&i? Is there a need for compensating the public when the knowledge that belongs to a commons is exploited for commercial usage? And if so, what kind of compensation is adequate? Or will the model of the future be that the public, in addition to covering the cost for the production of knowledge, finances commercial OA publishing as it has done by financing libraries? Which rights should authors who create new content have? Are the moral rights (primarily attribution of authorship) sufficient, or should an appropriate remuneration system be established? Is it still appropriate for the state to regulate processes for knowledge commons, for instance, via patent or copyright laws? Or should it be up to the commoners themselves to organize k&i processes, rules and enforcement systems? In this essay we have concentrated primarily but not exclusively on knowledge in science and education environments, and also on institutionalizing forms via formal procedures such as copyright law. This is obviously a rather reductionist approach. Knowledge as an immaterial commons has a much broader range, and there are many ways of transforming knowledge as a common-pool resource into an accessible and usable commons. The debate on how best to institutionalize knowledge as an immaterial commons is still open. Free Culture Forum. 2010. Charter for Innovation, Creativity and Access to Knowledge 2.0.1: Citizens’ and Artists’ Rights in the Digital Age. Barcelona, Spain. http://fcforum.net/charter_extended. Hess, Charlotte; Ostrom, Elinor, eds., 2007. Understanding Knowledge as a Commons: From Theory to Practice. Cambridge, Massachusetts. MIT Press. Kuhlen, Rainer. 1991. “Information and Pragmatic Value-adding: Language Games and Information Science.” Computer and the Humanities (25):93-101. http://www.jstor.org/pss/30200254. —————. 2010. “Ethical Foundation of Knowledge as a Commons.” In Proceedings of the International Conference commemorating the 40th Anniversary of the Korean Society for Library and Information Science. Seoul, Korea. Oct. 8th 2010. http://bit.ly/fEAZyK. 2. For example: The compact for open-access publishing equity supports equity, or COPE, of the business models by committing each university to “the timely establishment of durable mechanisms for underwriting reasonable publication charges for articles written by its faculty and published in fee-based open-access journals and for which other institutions would not be expected to provide funds.” (http://www.oacompact.org/). Cf. SCOAP3 – Sponsoring Consortium for Open Access Publishing in Particle Physics (http://scoap3.org/); and the SpringerOpen model of prepay membership (http://www.springeropen.com/libraries/prepaymembership). Rainer Kuhlen (Germany) is Professor Information Science, University of Konstanz; Member of the German Committee, UNESCO; and Member of the Green Academy. His most recent book is Successful Failure: Twilight of Copyright? (2008, in German). His current project is IUWIS, http://www.iuwis.de. Personal website: http://kuhlen.name. Blog: http://netethics-net.